If you have lemon squash ready in your home you can make a number of recipes easily in5-7minutes any lemonade. Today I am giving the variety of lemonade and summer refreshment drinks made with lemon squash. It also good during iftar time in Ramadan. Pomegranate lemonade is so easy to make. First, make pomegranate juice, place pomegranate seeds with little water in a blender. Pulse the seeds a few times to break them and release their juice use a mesh strainer to strain the pomegranate liquid into a container, and discard the pulp. First, take a big glass pitcher add crushed ice first then pomegranate juice, lemon squash, sparkling or simply cold water mix well. Pomegranate lemonade is ready garnish with some pomegranate seeds and little ice and serves it. Raspberry lemonade is incredible, yummy. If get fresh raspberry fresh its flavor come perfectly, it might be new favorite drink. It is also very easy making at home too. If didn’t get your place purchase frozen one pack. First, make it puree with a blender until smooth paste uses and water, little water, squeeze raspberries puree with a fine-mesh sieve remove pulp and seeds. Pour raspberries puree into a big glass pitcher, add lemon squash crushed ice, cool water, stir together. Raspberry lemonade is ready, serve with ice cubes. Mint masala soda is one of the best drink for children in summer, it is such a delicious drink. This is a thirst quencher and loves it on hot summer days.it is one of the most requested drinks by my kids during summer. First, wash mint leaves and blind smooth paste in a blender with some water make it smooth mint puree, squeeze mint puree with the fine sieve. Take a couple of glass add1/2 cup lemon squash, mint puree1tsp, cumin powder, black salt, black pepper, chat masala, then add crushed ice mix well. After that pour soda in and mix well add some ice cube,(if you want more chilled )and sprinkle chat masala. Mint masala soda is ready, serve it. Fresh watermelon lemonade is very refreshing and easy recipe in summer if you want little twist you can add sparkling water. First, scoop watermelon, blend into a blender until smooth. Strain watermelon through a mesh strainer, discard seeds and pulp. Take a glass pitcher first add crushed ice, then lemon squash stirs well, add watermelon juice and water. Watermelon lemonade is ready. Serve immediately over ice and garnish with mint and if you like chaat masala then sprinkle little. 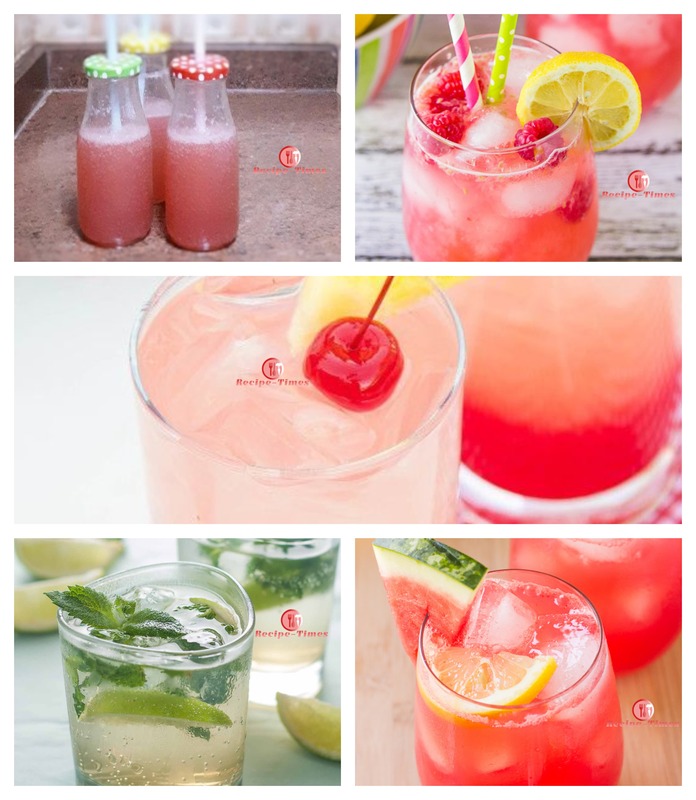 Cherry pineapple lemonade is very easy and quick and delicious recipe. It is sure to hit the spot this summer. First, take a heavy-based pan on low flame add pitted cherries, sugar, and water for making cherry syrup stir continuously cook 10 -15 minutes, squeezing cherries very well. then go and strain through a fine strainer. Our cherry syrup is ready. Keep it aside for cool and refrigerate this syrup. When you want to serve to take a couple of glass firstadd1-2 tbs.cherry syrup then add little-crushed ice add pineapple lemonade mix well.